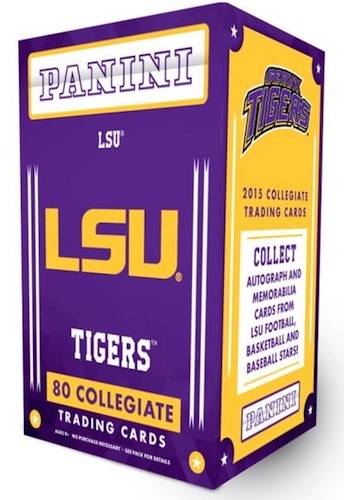 Take a trip to Baton Rouge with 2015 Panini LSU Tigers Collegiate trading cards. The multi-sport release pays special attention to the basketball, football and baseball programs for the Tigers and also offers at least one autograph or memorabilia card per box. Featuring an 80-card base set, the product includes a detailed look at the athletics program at Louisiana State University. Former basketball stars include Pete Maravich, Shaquille O'Neal, Glen Davis, Brandon Bass and Jarell Martin. Football is covered with players such as Odell Beckham Jr., Tyrann Mathieu, Dwayne Bowe, La'el Collins, Danielle Hunter and Jalen Collins. Baseball also receives considerable focus with Aaron Hill, Aaron Nola, Alex Bregman and D.J. LeMahieu. Extending to baseball, football and basketball subjects, collectors can find Signatures and Memorabilia card options for the former Bayou Bengals. Signed parallels, limited to 99 or less, are also available. The main insert, Honors, features some of the most successful college players for the program, specifically highlighting winners of the Rupp Trophy for the nation's top basketball player and Chuck Bednarik Award for the best defensive player. Several parallels are available, including Silver, Gold and Black, that extend across the base and inserts sets. ZACH METTENBERGER 2015 SPECTRA REFRACTOR AUTO AUTOGRAPH RC #02 99! TITANS LSU!